So you know how when you see a recipe on Pinterest that catches your eye and you can't wait to try it... Yeah, this is one I was geeked to give a shot at. Yum! It seemed so simple and delicious ~ And it is. I only changed a few things to make it gluten free and using items we like. You can find the original recipe from joelens.blogspot.com through my Pinterest link here. Preheat the oven to 350 degrees. Spray loaf pan with cooking spray, set aside. In a large bowl, combine the ground chicken, egg, bread crumbs, tomatoes, and Parmesan cheese. Mix with hands, just like a meatloaf. Place the mixture in the loaf pan and form into a loaf. Top with the pasta sauce. 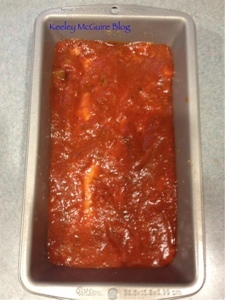 Remove from oven and sprinkle on the mozzarella cheese. Place back in oven until cheese has melted. Remove from oven again and allow loaf to rest for 5-10 minutes before slicing. Everyone loved this - the fella and Little Miss. We sprinkled a little extra Parm on top when we served it too. BAKE THESE IN A MUFFIN PAN INSTEAD FOR A GREAT LUNCH BOX IDEA! SEE POST HERE! 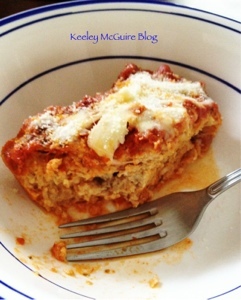 I'm linking this recipe over at Allergy Free Wednesdays! Holy heck this looks amazeballs! 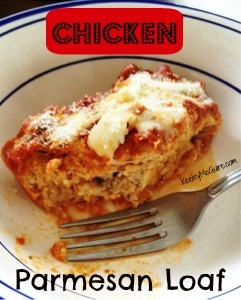 What a tasty chicken dish that my family would gobble up for dinner! Thank you so much for sharing your great recipe on Allergy-Free Wednesdays! Be sure to check back next week for recipe highlights (including the top 3 reader choice submissions and hostess favorites). Thanks for the recipe. Your post has always been helpful on my quest towards new bento menus. My children would absolutely love this!